We have seen Familial Hypercholesterolaemia (FH), a condition characterised by a high blood level of cholesterol. We have seen that it results from a genetic mutation (one of several) that that will be continued though generations of the family. The actual moment of mutation has not been observed (investigative genetics is new) and it could have been in the families for many generations. We have seen that FH can lead to a survival advantage for an individual and ultimately within the family, demonstrated clearly in the 19th century. However under certain circumstances it can lead to a serious health disadvantage and this has been the case during the 20th century of epidemic of coronary heart disease (CHD). Although this disadvantage might shorten life, the genetic mutation will become widespread if major disability and death occur after the years of reproduction. It is likely that survival advantage is the result of a higher expression of defensive LDL-cholesterol in the inflammatory process. The disadvantage during the CHD epidemic is due to the increased amount of cholesterol in the inflammatory reaction causing partial or complete blockage of one or more coronary arteries on the surface of the heart. A parallel with FH is sickle cell disease (SCD) which has a similar genetic pattern and it also demonstrates an interaction between genes and environment. In tropical sub-Saharan African countries, malaria is a common and serious problem. It can lead to chronic illness and early death, often in childhood. Malaria causes more than 600,000 deaths per year, 90% in Africa, 77% in children. Much medical effort is put into finding a solution, but nature has gone some way to finding one. 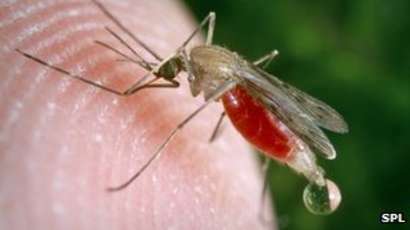 The malaria parasite, Plasmodium, is carried by infected female Anopheles mosquitoes, which can pierce the skin and feed on human blood. In the process the malaria parasite is transmitted from the mosquito saliva into the the human blood. When it enters the blood stream it finds a home in the red blood cells within the circulation. There is also a secondary liver phase but that need not concern us at present. The malaria parasite feeds and multiplies within the red cells, and every three days (usually) the red cells burst, releasing the parasites within the blood stream. This causes a characteristic high fever with rigors. 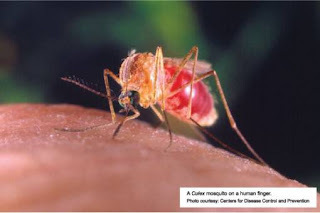 When the release is every three days it is called tertian malaria (due to Plasmodium vivax or ovale), and less commonly if every four days quaternary malaria (due to Plasmodium malariae). The rigors are more frequent or perhaps more or less continuous in the much more serious Plasmodium falciparum infection. Whichever is the variety of Plasmodium, the essential host factor is “normal” haemoglobin and thus normal red blood cells, something that is also necessary for good human health. Mutations have occurred at some stage in the past that result in an abnormal haemoglobin molecule, due to a single amino acid variation in the gene. As a result the red blood cells are abnormal in structure and function. Sickle cell disease (SCD) is the best-known and most serious mutation, and it is quite common in African people, where malaria is most common. The abnormal type of haemoglobin is called HbS, the normal adult haemoglobin being HbA and in the foetus HbF. 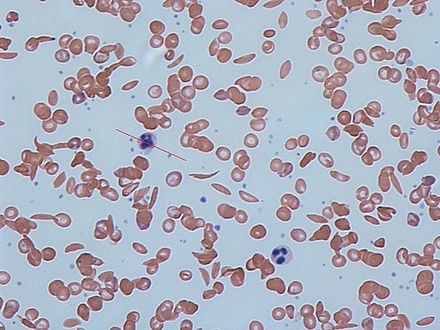 The presence of HbS in the red cells results in the red cells tending to deformity, a “sickle” shape, particularly under circumstances of oxygen deprivation. 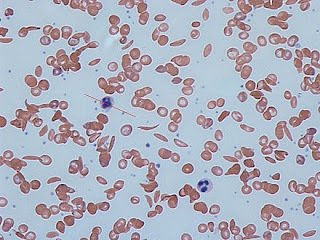 People with SCD are found to be protected against malaria, and it is now known that Plasmodium parasites cannot readily reproduce within the abnormal sickle-shaped red cells, which tend to rupture prematurely before maturation of the Plasmodium offspring. Because of this, people with SCD have a distinct survival advantage when the prevalence of malaria is high, and this is why SCD is common in such countries. We have therefore another example of a mutation that will result in a disease state, but nevertheless it gives a survival advantage under the environmental circumstance of a high risk of malaria. In West Africa the prevalence of SCD is about 4% (this can be regarded as quite common compared to other genetic abnormalities). In the USA, where there is no malaria, the prevalence of SCD (which therefore provides no advantage) has fallen to 0.25% among the black population and is thought to be still falling. Those with the mutation are now at a survival disadvantage. SCD is generally considered to be due to a recessive gene, as two inherited genes are necessary for the full disease. It is clear that the homozygous state (two abnormal genes, one from each parent) gives a serious disease, but on the other hand a high level of protection against malaria. The two abnormal genes mean that only the abnormal HbS can be produced within the red cells. The heterozygous state (inheritance of an abnormal gene from just one parent) is called Sickle Cell Trait. There is some advantage in protection against malaria and just mild disease. There is production of both HbS and normal HbA. The pattern of inheritance is thus similar to FH, mild disease in the heterozygous state and serious disease when homozygous. The use of terms Sickle Cell Disease - homozygous - and Sickle Cell Trait (SCT) - heterozygous - is valuable without trying to define whether the gene is recessive, partially recessive or dominant. SCD and SCT give an advantage in Africa. But if an African person with inheritance of SCD comes to live in temperate countries such as the UK or the USA, where there is no malaria, the health and survival advantage is no longer relevant. The disease state, SCD, then becomes of over-riding importance, and it might be severe, disabling, chronic, and ultimately it might be fatal. There is no major illness in the heterozygous trait, just low-grade asymptomatic anaemia. This benefit outweighing the disadvantage in the heterozygous state can be called the "heterozygous advantage". Similar to SCD is Thalassaemia, another genetically determined abnormality of haemoglobin (they are in general called “haemoglobinopathies”). Thalassaemia gives rise to low-grade anaemia that can be mistaken for iron deficiency. The heterozygous state is referred to as thalassaemia minor, and the homozygous state thalassaemia major. Thalasaemia also gives some protection against malaria, but both the protection and the disease are not as powerful as with SCD. Whereas SCD is common in Africa, thalassaemia is common in south Asia, where the threat of serious malaria is much less. It has also emerged as an evolutionary advantage but only in areas with malaria. There is again a heterozygous advantage. The interaction between genetic change (mutation) and environment is fundamental to the progress of evolution. There has been a genetic advantage to a white skin in people living distant from the tropics this being Neanderthal inheritance. Vitamin D production by the action of the sun on the skin is greater when the skin is not pigmented, and this is an advantage when sun intensity is low. On the other hand a white skin in the tropics is a distinct disadvantage as lack of pigmentation of the skin fails to protect against the damaging effects of intense solar radiation. We have seen that mutations can under certain circumstances give a survival advantage, and this is the process of evolution. 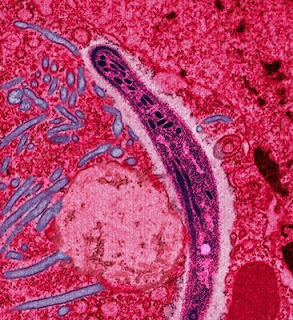 Mutations creating abnormal haemoglobin and red blood cells can give a survival advantage in places where there is a high risk of malaria, but illness when there there is no malaria. It does not appear that there will be an end to malaria, and so sickle cells genes will continue. In the case of familial hypercholesterolaemia, FH, which gives an improvement of defensive inflammatory processes, this can represent a positive contribution to evolution. Under a 20th century environmental circumstances the mutation resulted in a major disadvantage – during the epidemic of coronary heart disease, CHD. This disadvantage appears to have been only temporary, during the little more than 50 years. It is likely that in the future the advantage of hypercholesterolaemia will continue and the genes will spread within the population. With careful record-keeping and research, we will be able to record the effect of this – evolution in action. This is a great opportunity.